Most orders will be shipped within one business day but it may take up to 2 weeks for delivery. Thank you for supporting a woman who fishes and mentors kids who fish! 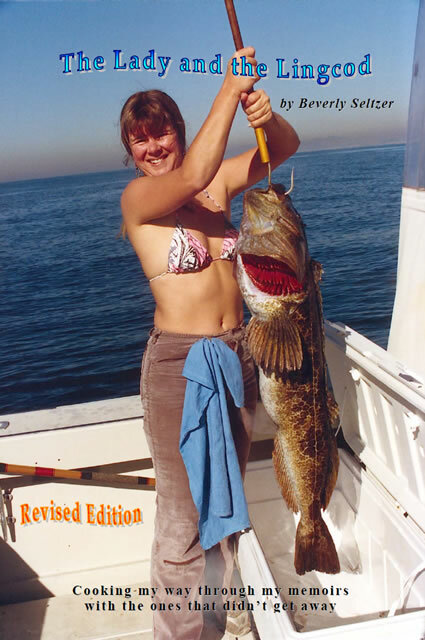 The Lady and the Lingcod is an informative and entertaining cookbook by first-time author, Beverly Seltzer, retired commercial fisherman and life-long sportfishing enthusiast. She cleverly weaves short stories of her fishing adventures, along with fishing techniques, tips and humor, among her collection of recipes for Pacific saltwater fish that she’s targeted over the years. This book presents recipes for albacore, bluefin tuna, blue marlin, cabrilla, Chilean seabass, dorado, halibut, lingcod, mako shark, petrale sole, rockfish, salmon, sand dab, sierra, wahoo, white seabass, yellowfin tuna, and yellowtail; citing substitutions for about 30 others. Some of these are familiar species that are widely fished commercially, while others you’d only get by going out and fishing them for sport. Besides the recipes, the book is chock full of anecdotes and useful facts to help you catch them, pick them, or just get to know a bit more about the fish. Readers will not only learn how to prepare the fish they’ve bought — or caught — but will also have some fascinating stories and facts about the fish they’re serving up.